The usual junk, a Marlboro miles prize bike (I'm guessing) that is a folding Fuji?, an Al Raliegh but with 1" steerer, and then I see it. A steel Specialized Hardrock with a 1 1/8" head tube. Needless to say, I brought it home and stripped off the crappy parts (it had a threaded suspension fork? didn't know they existed). So it has crazy dropouts. They look like horizontal dropouts that haven't had all the material removed. They drilled out the back and front but didn't connect the two holes. Can I take out the rest? This would give me some chain adjustment. That will have to wait until I get my cell phone back in range. It's my only digital camera. And though I can see the pic on the phone right now, I'm 10 miles from a signal. They look like horizontal dropouts that haven't had all the material removed. They drilled out the back and front but didn't connect the two holes. Can I take out the rest? This would give me some chain adjustment. I am not a materials engineer, but would think this would be bad. I am pretty sure I remember the DO you are describing, and by removing material, it will allow the axle to flex the curved (back part) of the DO and possibly crack/shear the lower segment of the DO off. If you were moving and said cracking/shearing occured it would result in some sort of drama. I am not 100% sure, hope someone else has input.....oh, post a photo. Go for it. Should work fine. 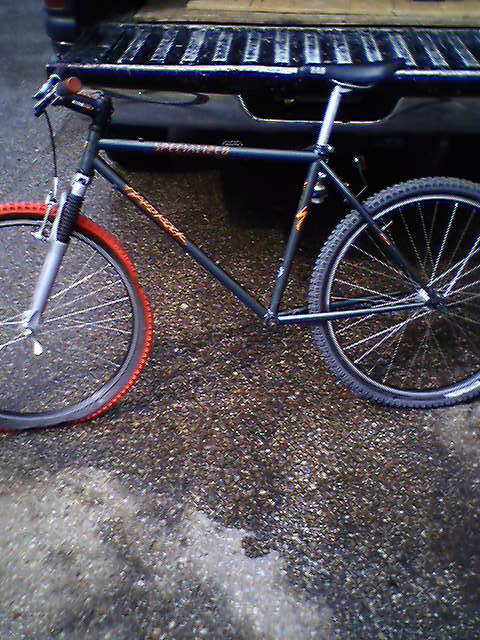 i had the same issue witha giant road sport that i was making into a fixed gear. an angle grinder will do nicely. I have a '91 RockHopper Comp frame with the same DO's, and I "connected the dots". I've built and ridden it as a SS and as a 700c fixie, no problems at all. That's thick steel. Here's a before. After coming soon. I did this to an 88'ish Hard Rock and have put thousands of miles on it with no problems related to the modified dropouts. And, of course there were threaded suspension forks. Sheesh, youngsters these days! Wait, you're older than me.